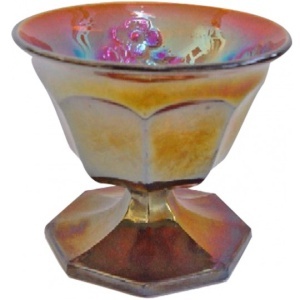 Pattern Description: Small compote with a paneled exterior and an 8 sided base. The interior center has an 8 pointed star (with stippling) circled with beads. Around the center pattern is a square wreath with flowers in the corners. These small compotes are made from the same exterior mold as Millersburg's Leaf and Little Flowers compote. 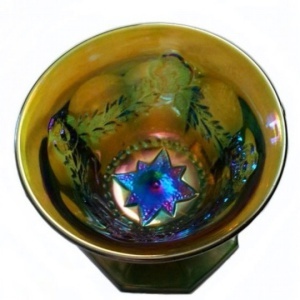 The Olympic has a garland design around the inside of the bowl and a star in the center. 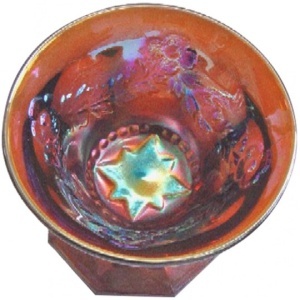 The height is 3″ and the width of the top is 3 1/2″. The base is 8 sided and the back contains 8 panels. 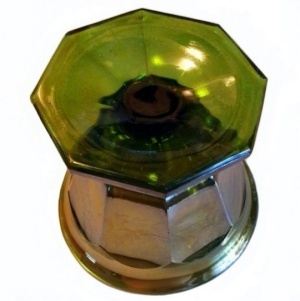 There are two known; one each in amethyst and green. The amethyst sold for $2,850 in 1990, then for $4,600 in 1994.